Batten down the hatches. High winds and wet weather are poised to soak the D.C. area this morning. Gusts exceeding 60 mph are possible. 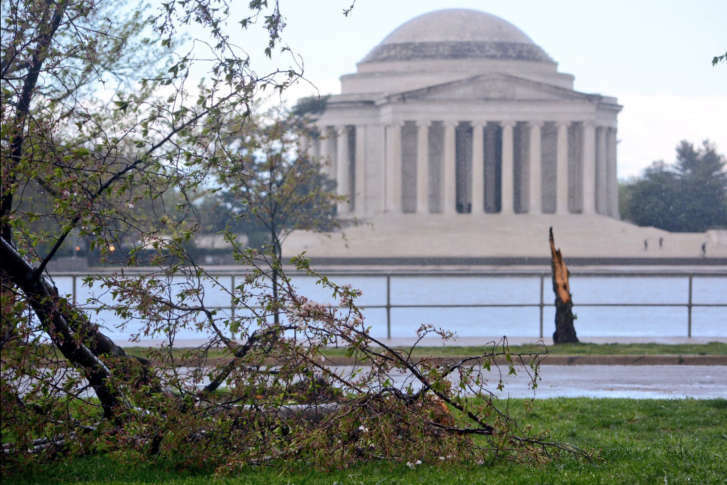 WASHINGTON — A severe storm tore through the D.C. region Thursday afternoon inundating area roads and creeks, uprooting trees along the Tidal Basin and shredding the metal roof of a church in D.C.
Pebble-sized hail was reported from Manassas, Virginia, to Gaithersburg, Maryland. And thousands of power customers were without electricity throughout the region. Rotation in the storm briefly triggered a tornado warning while the storm was still in the far western Virginia suburbs. A funnel cloud was spotted in the Arcola area, but it did not touch down and no damage was reported except for a tree that fell onto a car. The warning was dropped as the system crossed the Potomac River into western Montgomery County about 2 p.m. Severe thunderstorm warnings and watches have been allowed to expire regionwide. But rain showers continue to pop up across the region. A chance for thunderstorms remains for the rest of the afternoon and into the evening, however they are not expected to be as strong as the storm that ripped through the region early this afternoon, said Storm Team 4 meteorologist Matt Ritter. About 1. 5 inches of rain had fallen over the region as of 5:30 p.m., Ritter said. After reaching into the 60s, temperatures have tumbled behind the line of storms and are expected to remain in the mid 50s for most of the day, he said. The intense rain led to ponding on some roads and overloaded creeks have flooded others. Downed trees have also led to road closures regionwide. Police closed the northbound lanes along D.C. 295 shortly for hours because of standing water and damage to the pavement. The road finally reopened just before 6 p.m. Motorists reported tree debris along Interstate 395 in Shirlington. And Prince George’s County firefighters rescued three people who were trapped in high water in Laurel. 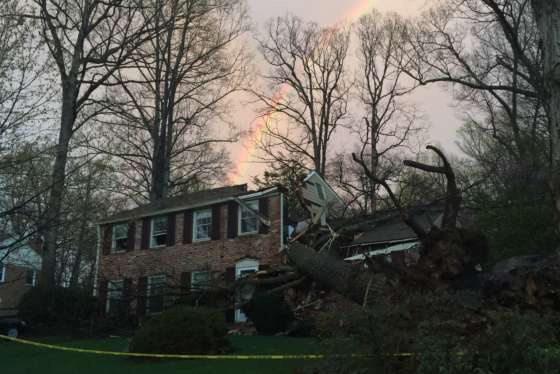 In Annandale, a tree sliced through the rough of a house and knocked down the chimney. A resident of the home had to be rescued by firefighters. Along the Tidal Basin, about a dozen mature trees were brought down by the strong winds including elms, pine and a few cherry trees. Debris also damaged the window to a van parked at the paddle boat launch. The heavy rain also affected air travel. Reagan National Airport reported that departures were delayed on average 1 hour or more at the height of the storm. The rain has also delayed the Washington Nationals’ 4:05 game against the Marlins. Severe thunderstorms, gusty winds and hail tore through the D.C. area Thursday afternoon, briefly prompting a tornado warning in the northwest suburbs. See photos. WTOP’s Dave Dildine and Michelle Basch contributed to this report.